Sullivan's Clear Choice Shampoo [CCQ or CCG] : Highland Livestock Supply, Ltd, Products for all of your show animals! 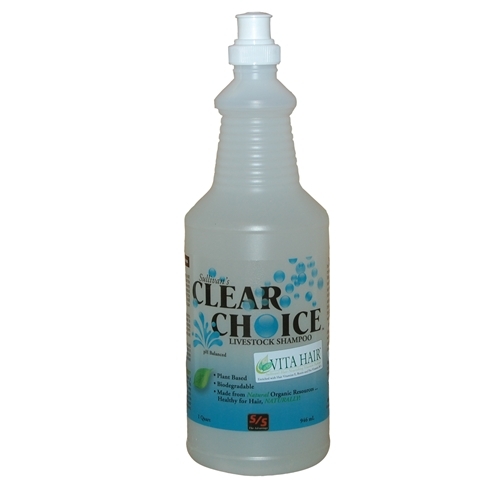 Quart or Gallon - Clear Choice is the ultimate in livestock shampoos. It is pH balanced for livestock skin and hair unlike other shampoos that strip natural oils from the hair and destroy hours of hair training work. It cuts dirt and grime deep into hair coats and allows hair to separate with ease. Now available with Sullivan's new Vita Hair Package that contains Biotin, Pro-Vitamin B-5, and Vitamin E. Rinses out easily.